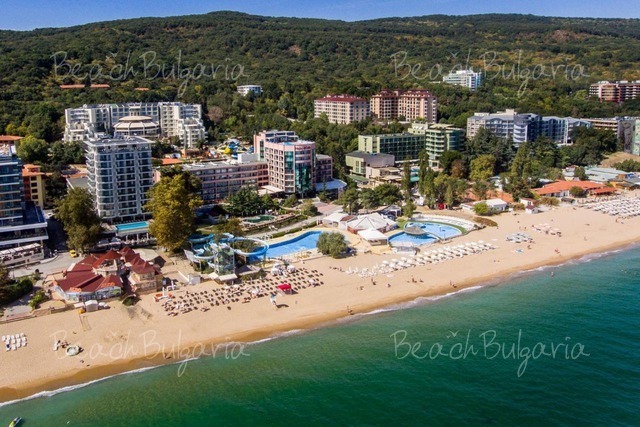 Laguna Garden hotel is situated 100 m from the beach, at the beginning of the main street in Albena Black sea resort. Accommodation: The hotel features 29 single rooms and 225 double rooms. The guestrooms feature bathroom with shower/ WC, hairdryer, air conditioner, telephone, cable TV, mini bar (extra charge), balcony. Safe deposit box and fridge can be rented on the reception desk. The property features a cocktail bar and an air-conditioned restaurant. The restaurant offers 360 places in the hall and 100 places on a terrace, variety of meals, theme evenings, show cooking, snack bar. The restaurant's hall is for non-smokers. The Lobby bar serves local alcoholic and non-alcoholic beverages, cocktails, hot and cold drinks from 10 to 24 h. All imported drinks are offered for extra charge. Conference hall, change, air-conditioned reception, hairdresser, parking, mini – market, outdoor swimming pool, swimming pool for children. The hotel operates on All Inclusive basis. - Beach volleyball, football, basketball, aqua-aerobics, step aerobics, darts, table tennis, chess, backgammon. * The prices are in Euro per room per night, all inclusive. Guests of the hotel can use swimming pool, sunbed and parasol on the beach. * Maximum capacity: Double room - 3 adults or 2 adults + 2 children; Studio: 2 adults + 1 child or 3 adults; 2-bedroom apartment - 4 adults + 1 child or 5 adults. I stayed at the Laguna Garden Hotel for the second time last week. I returned home yesterday and today i am trying to find dates so that i may come back with friends in September. The Hotel is in lovely location. The staff are friendly and efficient, and the catering is good. not a bad word to be said! We had a fantastic stay at the Laguna Garden Hotel Last Year. It was very clean, the rooms were great. Food was different but nice, staff thought we were strange when we asked them to flip our eggs to cook the tops, but they obliged. After that other people were asking too. Staff are very polite, friendly and helpful. There was 1 beggar in the market near the hotel, but he never pestered anyone. We were always able to get a poolside lounger. We loved it that much we are all booked up again to go this year. very good hotel food not bad either my family and i not long back good holiday had by all. Visted this hotel from 22nd July-5th Aug 2004 with First Choice Holidays. Upon arrival we were jumped upon by men who we thought worked for the hotel to carry our luggage from the coach to the reception area, later we discovered these men work for the cycle hire outside the hotel and have timetables telling them when to expect the next coach load of unaware tourists! We were first approached as soon as we got off the coach by one man who demanded Lev or Sterling we had no lev in change yet so he asked for £2 so unaware what they expect I handed it over, only to discover the next porter who does work for the hotel who took our luggage then from the reception up to our room and the HE held his hand out and I had no more change and he was very cheesed off with us! But despite our arrival plus one of our suitcases getting damaged it was a lovely hotel and Albena is a lovely clean resort. I traveled with my husband and two children who enjoyed the pool and the beach near by. We would highley recommend the Laguna Garden Cafe Bar directectly outside the hotel to the right who have wonderful friendly staff and a man and woman who play the keyboard, saxaphone and sing. This was our favourite bar and we must mention Vince and Mimi who are a waiter and waitress, please say hello from us (Mimi is small with dark long hair and took a special shine to my son Thomas who is 5 years old, please say hello from him as she cried when we left and it got me upset and I had to walk away before it set me off!. We still sing the songs to him to remind him of his stay as we only returned last Thursday and wish we were still there. The food in the hotel was a little disapointing. The man who cooked the bacon and eggs needed a bomb up his backside as he cooked tiny pieces of meat that you thought was bacon but tasted more like spam, so slowly and in small ammounts. Also the white off the eggs always were runny so I always used my hand to interpret flip them over to cook them.Somedays we had to queue for food and then we couldnt find a table and had to leave our food and walk out. We did on some occasions have to eat out as our children were so hungry and the restaurant was so busy we had no choice. The childrens choice was terrible what child wants pizza with peas and sweetcorn on! Most days my kids just ate chips. The room was very small for 2 adults and 2 children and if they were any bigger we wouldnt have managed with the small wardrobe for the 4 of us. My husband kept his clothes in his suitcase as they wasnt much room. However the rooms we well cleaned every day and the cleaner was lovely we gave her a 20 Lev note the day before we left and she was so greatful as I beleive they only earn approx £80 per month and they work so hard all day for it. One thing I noticed is that many of the stalls in Albena are selling items that have not cost them anything more like their skills for example, painting, braiding hair, henna tattoos etc, as they are very poor but very talented. All the people I met in Albena were lovely people and great with children we had no worrys on that score. We went on a trip to Varna to see the Dolphins and then we went into Varna for 2 hours free time before we had to get back to the coach. Varna is great for shopping and so much cheaper but beware of pick pockets and men coming up to you in the street wanting to exchange money beware as they often mix Russian money in with it and rip you off, always use the banks or hotels to exchange money. 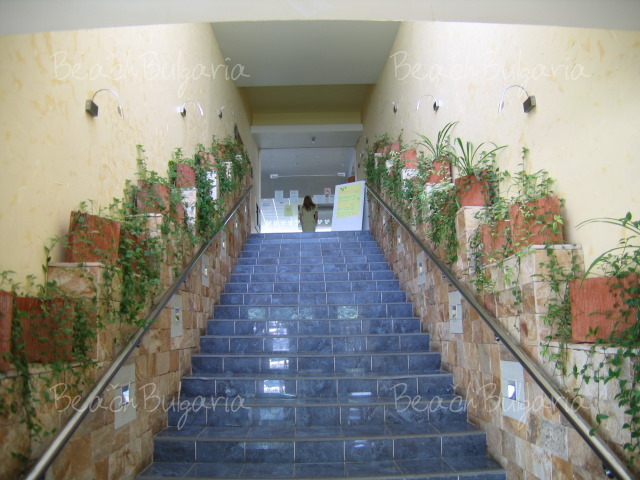 Later in the holiday we decided to go to Varna on our own in a taxi which cost us 50Lev return which is about £20, it took about 30 Minutes to get there and we paid the driver on our return to the hotel. We also got a taxi for 30Lev to Golden Sands and this was a much bigger and busy resort. Bulgaria is cheap but we still managed to spend more than we thought as the kids drinks in the bars and hotel were 3Lev each and if you bought them from a shop they were 1.5Lev and when they drink so much because of the heat it all adds up. The beer however worked out at 2.50Lev for a large one which is about a £1. Ice creams were cheap outside the hotel in the market street between 0.50-1Lev which is 20-38p. When we ate out we went to Peters House and the food there was excellent especially the cooked breakefast which had proper baked beans as the ones in the hotel are terrible and taste nothing like beans like most other bars apart from Peters. Take a photo with you if you want it painting on canvas as they have many talented artists outside the hotel in the market and they are very reasonable. Also I bought a lighter, compact mirror and keyring which they engraved a photo I took onto them, this is something you cant get back home and make great presents. 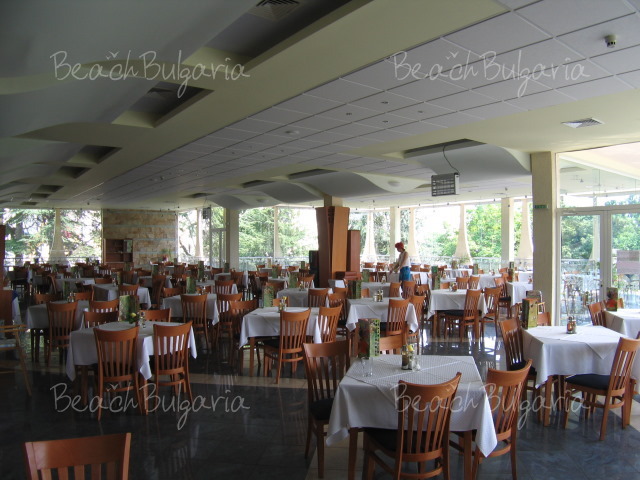 Basically if you go to Albena in the Laguna Garden dont expect fantastic food although it is edible and acceptable but not to everyones taste, also the hotel is clean and comfortable and the people are great. Have a good holiday we did! 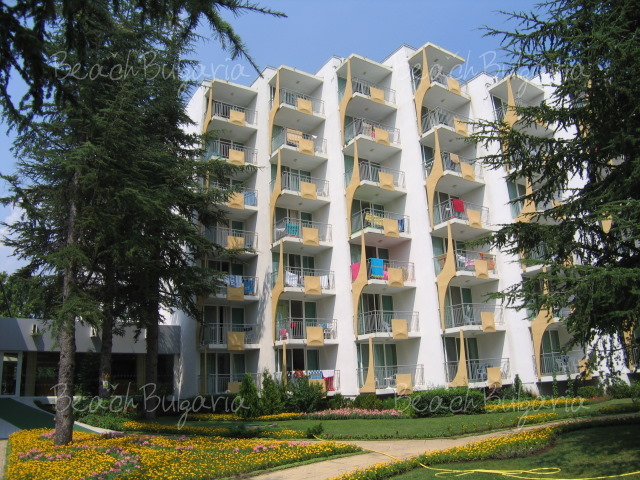 Just got back from a week in Albena – staying in the Laguna Garden hotel, half board with First Choice holidays. Both the resort and the hotel were lovely. 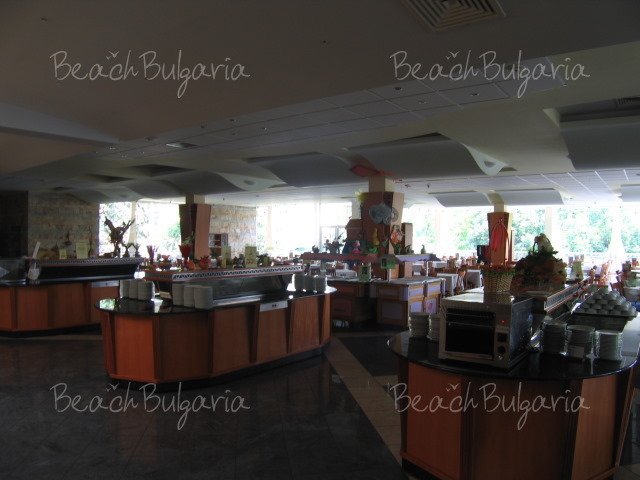 Albena is quieter, smaller and less busy than Golden Sands (where we went for a day trip) and we much preferred it! It is still quite geared towards the German tourism market (as are most of the resorts/tourist attractions) so a great opportunity to test out your German (or Bulgarian!) language skills - but if those fail, practically everyone also speaks English! 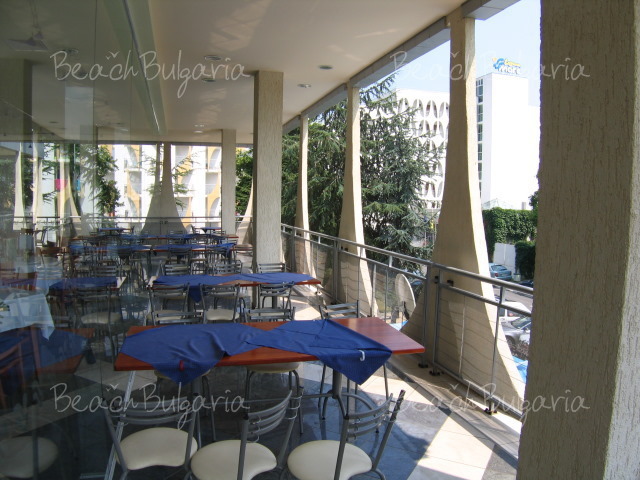 A really good place to go for panoramic views of the resort – especially at night - is the Ciel Bleu bar on the 17th floor of the Dobrudja hotel (also known as the “mother ship”). The hotel was in a great location and relatively quiet. The only slight disappointment was that we did not get the sea view we had booked, however, this was because the hotel does not have any sea views (First Choice customers take note!) and our room - at the back of a hotel - was otherwise fine (even though it looked onto a small car park). Probably the only thing that let the hotel down was the food. Breakfast was fine (I could have survived alone on those little cakes that are kind of croissant shaped, covered in icing sugar and with Turkish delight in the middle!!!) but the evening meals were not that great (so it was good that we hadn’t actually planned on eating these at the hotel despite being half board), however, you won’t go hungry - there was always plenty of food available including chips, salad and fruit if you’re really stuck. For eating out we’d suggest the Izkorova and the Fisherman’s Cottage (at the end of the beach). Most places have some sort of entertainment programme with folk dancing but the timings are pretty random so we mostly missed out - although we did get to see some dancing on one of the organised trips (Picturesque Bulgaria). You can also get out and about to many places by yourself on the regular minibuses from the bus station. Buses are cheap but often packed and there can be a scramble to get on. This is where the taxi drivers at the bus station come in handy - there are always plenty of them there trying very hard to get your business but they are completely non-threatening and harmless! We’d definitely recommend going to Balchik (for the Botanical Gardens and the Palace of Queen Marie of Romania) on the bus as you get more time to explore the huge grounds. Wine here is also about half the price it is in the resort. Varna (for the Cathedral, archaeological musem, churches and markets) and Golden Sands are also well served – although if you’re going to Golden Sands to visit the Aladzha Monastery – suggest you get a taxi from Albena as despite what the Rough Guide says it is not an easy walk nor is it well signposted from Golden Sands and we ended up getting a taxi from there. For Nessebar (which we disappointingly didn’t go to) suggest taking an organised trip and for the Petrified Forest and Cape Kalikara (well worth a visit) suggest taking a taxi – the driver will take you wait while you look around and bring you back for a pre-agreed fare. Also, we’d heard about ladies of the night in the resort and pickpockets in Varna – thankfully we weren’t troubled by either although in Varna you definitely need to be on your guard and some of the market sellers can be quite aggressive. Bonjour, guten Morgen, hello, It is with pleasure,i discover your internet site i have a funny request i collect the "Do not disturb", "doorknob" , "Privacy please", one of those piece that clients who want to sleep hang on their door. I do not have from your hotel and i would like to obtain one. If it is possible ,could you send me one and also the description of your beautiful hotel. Thanks a lot by advance and maybe see you . best regards Madame Briswalder Madame Briswalder Gabrielle 2 Impasse des Ecureuils 68730 Ranspach le Bas -France e-mail: brigabyserge@aol.com C'est avec plaisir que j'ai découvert votre site. J'ai une question un peu particulière à vous poser. Je collectionne les Do not Disturb ( ne pas déranger ou prière de faire la chambre) Petite pancarte que l'on accroche à la poigné de la porte des chambres. De votre hotel, je n'en ai point, et cela me ferait le plus grand plaisir d'en posséder au moins un. Si possible, pourriez vous m'en envoyer de votre superbe établissement ainsi qu'un dépliant concernant l' hôtel. D'avance un grand merçi et peut être à un de ces jours. Ich habe eine selsamer Wunsch: ich sammle die Hotelzimmertüre Anhänger mit " Bitte nicht Stören " oder "Do not disturb " .......und so weiter . Von Ihren Hotel habe ich noch keine, könnten Sie mir wenn möglich eine schicken , ebenso ein Hotelprospekt . Mit herzlichen Dank. Please, post a comment on Laguna Garden Hotel.